I am a professional landscape architect with a passion for painting. I have been working in oils for a number of years, with an earlier focus on still-life and nature objects. Over the past few years, I have turned to plein air, painting out-of-doors, and experimenting with quicker studies. I have also switched to water-soluable oil paints to eliminate the use of solvents, especially important when out in nature. Both my studio and plein air work are based on close observation and translating the beauty of what I see to a flat canvas. These days I am exploring the line between representational art and abstraction, and find that working with pattern and light on a canvas is more engaging than copying reality. 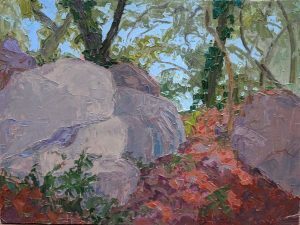 Painting plein air landscape enriches my understanding of the forms, light, and colors of nature, and it is a satisfying challenge to render that understanding in paint. Visit the Galleries tab, and you will find collections of paintings organized by place, project, or approach. Among the Galleries are work done while Artist-in-Residence in our local mountatins. I was honored to participate in the inaugural program sponsored by the Angeles National Forest / San Gabriel Mountains National Monument. I exhibited the paintings done at Crystal Lake Recreation Area at a group show at Heritage Square Museum, March 2016. I returned to the forest in May/June 2016 for another Artist-in-Residence stint, this time based at Little Jimmy Trail Camp, near the Pacific Crest Trail. To learn more about my landscape architecture work, visit elemental-landscapes.com.